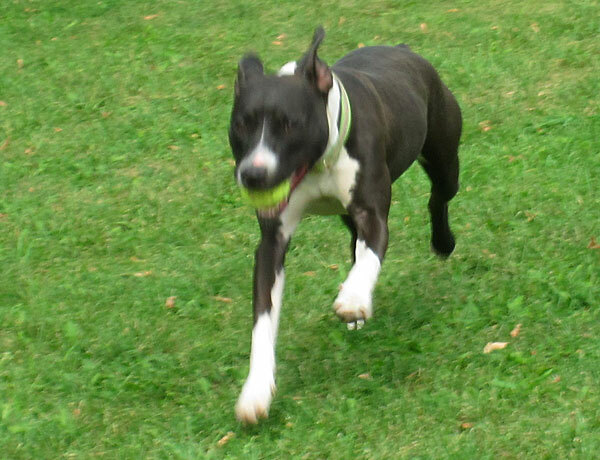 Indika got loose from her Brantford, Ontario home one day a couple weeks ago. She was found wandering or, as the city puts it, “running at large,” so she was picked up and taken to the Brant County SPCA. 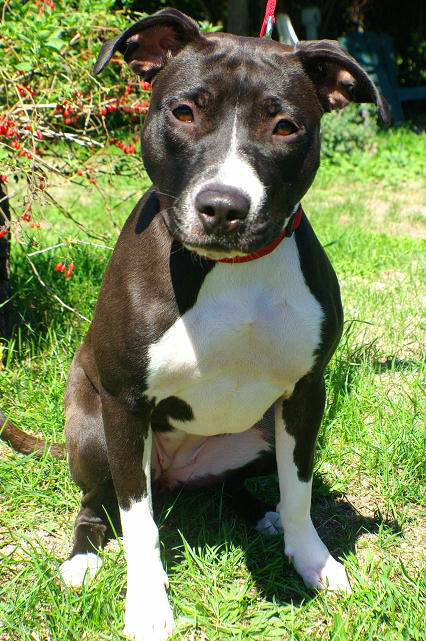 Because she “looks” like a Pit Bull type dog, she falls under Ontario’s Breed Specific Legislation (BSL) which bans her from living in the province of Ontario. Her owner came forward to claim her, but because he had no paperwork that would indicate her breed, he was not allowed to take her home. Had Indika been older, she could have been grandfathered into the law for being born before BSL went into effect on August 9, 2005. Pit Bulls already legally residing in the province before that date may remain legally in Ontario subject to certain conditions, such as spayed/neutered, microchipped, muzzled at all times off their property, and walked on a 3-foot leash. As well, the owner needs to have a city issued sign prominently displayed on their residence and an insurance policy covering the fact that they own a now prohibited dog. But Indika is a youngster. 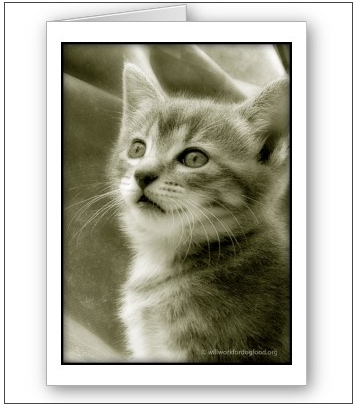 Fortunately for Indika, Brant County SPCA is an animal-centric shelter. They go above and beyond to find homes for the animals in their care. 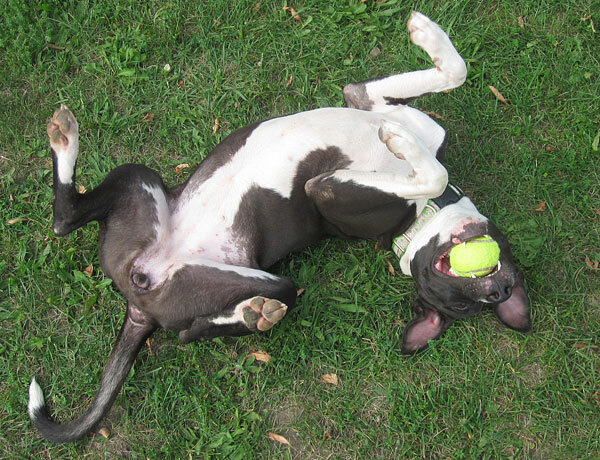 They are reaching out to people outside Ontario who might be interested in adopting her. Indika is approximately 8 months old and in good health. Her first set of vaccines, flea treatment and deworming have been done. She is negative for heartworms and is set to be spayed next week. Typical of a pitty, she is very affectionate; she thinks she is a lap dog and loves being around people! She is very tolerant of other dogs, and is very well-mannered all around. Indika has been SAFER tested and scored all 1’s which is ideal! She went through the Meet Your Match program as well. Her CanineAlity for the Meet Your Match was Go Getter (green). It is probably the busiest/most outgoing level and that makes sense. She is still a puppy which definitely ups her activity level! According to Niki at Brant County SPCA, Indika’s “a great dog with a wonderful temperament and we wouldn’t have a problem adopting her out at all.” Except they are located in Ontario. 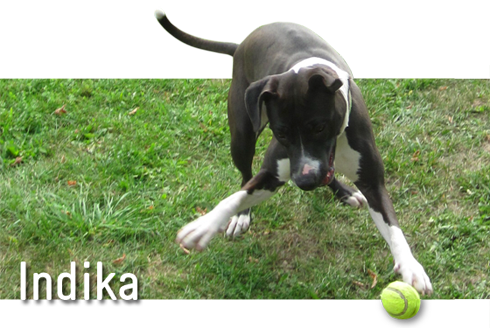 If you are interested in learning more about Indika, please contact Niki via email or you can call her at: (519) 756-6620. I hate the fact that a few dogs, poorly treated have spoiled the general view of these breeds for so many people. I own two rescue dogs; a straight pit bull, and a pit bull/newfoundland cross, and both are wonderful dogs. As for those who truly believe these dogs are vicious, and aggressive, I would love for you to meet my two. We have a stray kitten that we adopted recently, who was abandoned by the mother at 2 weeks, and who weighs just about a pound now. This tiny mite takes great delight in gnawing on the pit bulls’ legs! And the dogs love her in return!! As for aggression, how many people can say that their dogs will allow anyone to walk up to them while they are eating, and take the food, not just out of the bowl, but right out of their mouthes?! My two will let you take anything you want. I really hope that people will eventually wake up and realize that it is not the dog breed, it is the dog owner!! Some of the worst behaved dogs I’ve ever met have been “what a cute little doggie” breeds like chihuahuas, and miniature poodles. Get a dog, any dog, feed it good food, treat it like a dog, not a child, and you can’t really go far wrong! Next pit bull attack, instead of doing a report on the dog. Do a damn report on the owner and how the dog got that way. Thats what we do in gun shootings. Indika is a pretty little girl and I hope she finds a great home. I am sure she will be very grateful to her new owner. This sounds like “dog profiling” to me, not cool. I would have stole her back from the SPCA, but thats just me. I was wondering at what point a Pit Bull mix is NOT a Pit Bull. Would DNA testing have helped? If so, we could set up a chip-in for her.